File Name: Ryu Hoshi of Japan. Height: 5'11", Weight: 203 lbs. Note: In G.I. Joe's Street Fighter ad, the name rhymes with bayou. See this page for Ryu's depiction in the Street Fighter games, animation, and live action. Accessories: blue knife (92 Slice's), two blue knives (93 Banzai's), blue sword (92 Dojo's), blue sword (92 Storm Shadow's), blue axe (92 Dice's), blue sickle (92 Dojo's), blue figure stand (common). A student of Shotokan school of karate, Ryu has developed into a pure warrior. He has devoted his entire life to the perfection of his fighting skills and has forsaken everything else in his life. 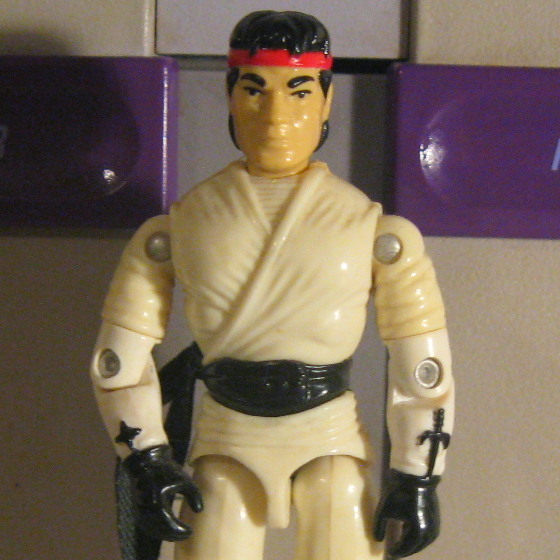 Ryu has no home, no friends and no family. Instead, he wanders the globe seeking to test his skills against other fighters. Probably the strongest all-around fighter, Ryu claimed the title of grand champion after his narrow defeat of Sagat. Cool and calculating, Ryu is very patient in combat. When Ryu observes weakness, he moves quickly to dispatch his opponents with the awesome power of his Dragon Punch. Motto: "You must defeat my Dragon Punch to stand a chance!" Toy Notes: Featured in the Street Fighter commercial (where the name rhymes with bayou). Ryu shares Slice's action move. Item #81086. Toy Notes: Ryu shares Slice's action move. The Dragon Fortress also included the figure Ken Masters. Item #6455. The prototype shown in the 1994 insert catalog has the head of Quick Kick (85). This figure is considered a moderately hard-to-find item.